Stores start stocking those yummy mini Cadbury eggs in February! Consequently, it’s easy to get caught up in the commercial aspects of Easter. It’s easy to forget the real reason we celebrate Easter. 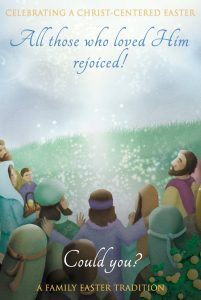 Celebrating A Christ-Centered Easter: Children’s Edition by Emily Belle Freeman and David Butler can help your family remember. “Discover how the people around Jesus during the week of His Crucifixion and Resurrection can lead your family closer to Christ this Easter season. 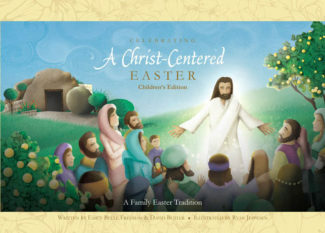 This children’s edition of Celebrating a Christ-Centered Easter will guide you through seven meaningful traditions inspired by the people closest to the Savior during His holy week. These simple experiences are not meant to add chores or stress to a reverent holiday season but to offer something different. They will give your family an opportunity to slow down from the candy and egg hunts and instead spend time reflecting on the Savior’s ultimate sacrifice and triumphant Resurrection. 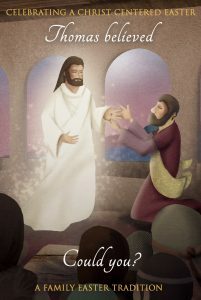 This interactive book invites children to get to know various people in Christ’s life during those sacred days and to discover the lessons they learned in their encounters with Him. 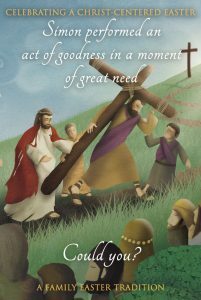 It encourages children to ask what they might have done if they had been there on the days when Jesus was crucified and resurrected. You know me; I love children’s books, especially holiday books. We have several Easter books, and even though my children are getting older, they still enjoy reading them. 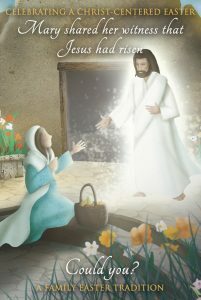 This book will be a fabulous addition to our Easter collection. You start reading it on the Sunday before Easter, and you read one section a day. On each day you read the scriptural account, you learn about a person, and you do a very small activity. There are ornaments to go with each day that you may download from the website to help remind you. I like that it takes the focus off the Easter Bunny and all the candy, and puts it back on the Savior. The illustrations are beautiful. I like this book a lot, and am excited to read it with my children this week. 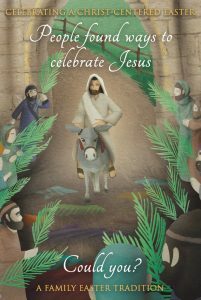 “Discover how each figure of the Nativity can lead your family closer to Christ this Christmas season. 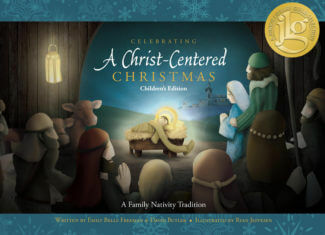 This children’s edition of Celebrating a Christ-Centered Christmas will guide you through seven meaningful traditions inspired by the Nativity setting. These simple experiences are not meant to add more to an already crowded holiday season but to offer something different. They will give your family an opportunity to escape from the frantic bustle of the Christmas season and spend time reflecting on the baby Jesus and the miracle of His birth. 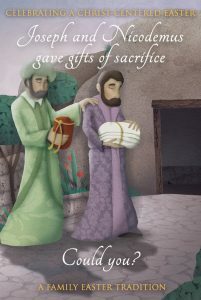 This interactive book invites children to watch each figure approach the waiting manger and encourages them to ask what they might have done if they had been there on the night Jesus was born. Seen beautiful ornaments have been created to accompany the lesson each figure teaches. Displaying the ornaments throughout the Christmas holiday will remind your children of the lessons they are learning about the baby Jesus. Your free download of the ornaments can be found at www.christcenteredcelebrations.com. Children’s picture books are one of my favorite things, and Christmas books are even better! I love reading them, and I especially love reading them to my kids…still! Even though they are big (my baby is 9! ), they will all sit and listen. This book will be a wonderful addition to our Christmas books, I am so excited to share it with them! I love the illustrations in this book; they are beautiful; whimsical, and yet so full of emotion. in this season? As you perform your secret act, think of Joseph. place Joseph’s figure in your waiting stable. The activities are mostly activities you may do anyway, and I’m sure you could do your own activities if you already have these traditions. It’s just a simple way to get the family together at the end of the day and remind them of the true meaning of Christmas. There is also an ornament for each day. You may purchase them ready-made or there is a free download on the website listed above. There’s also a cute banner that you may purchase, along with a simple Nativity scene. You don’t need anything fancy; just spending time together thinking of the story of the Nativity will bring the true spirit of Christmas into your home. I thoroughly enjoyed this book and highly recommend it!